This highly unusual antique American hooked rug has a A lovely curvilinear star pattern surrounded by floral clusters to either side. Beautiful Small Antique Floral Round American Hooked Rug, Country of Origin: America, Circa Date: 1900 – This antique rug was made in America around the year 1900. One of the most striking thing about this antique American Hooked rug is its circular shape. This beautiful round rug features a dark border that gives it a strong, bold look. 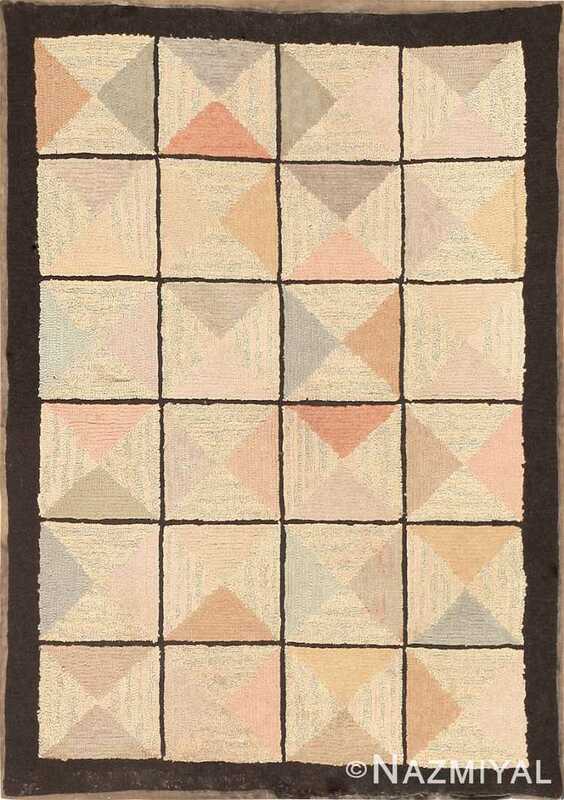 The main body of this unique small scatter size rug is the more neutral fawn color, which the other colors stand out very well against. The main element of this pattern is the purple rounded star or flower shape, which is a lovely symmetrical shape that draws the eye around the edges of this circular American rug. 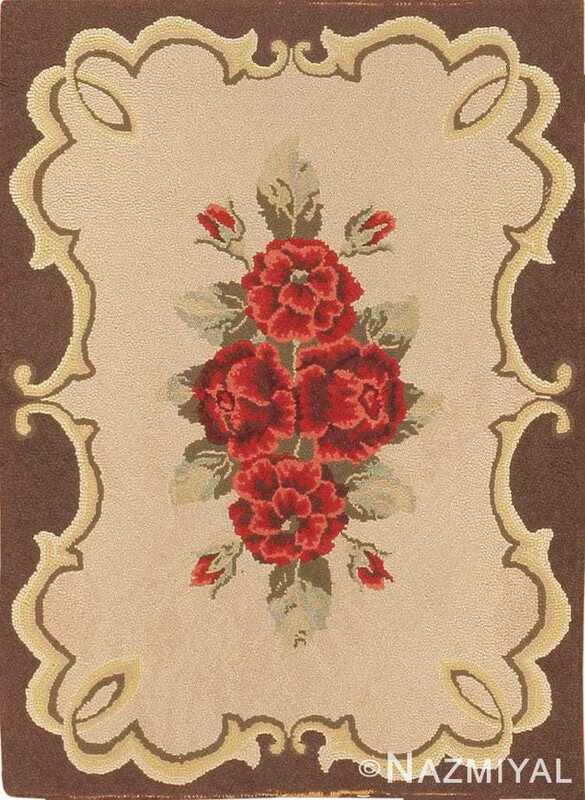 The floral elements are done in a lighter tan shade, creating a subtle play between the different colors present in the small round antique American Hooked rug. There are distinct patterns of flowers and leaves, and there are three larger flowers in the center area of the star shape. These larger flowers, which have elements of reddish tones within them alternate with smaller more neutral toned flowers to create an interesting and engaging pattern. 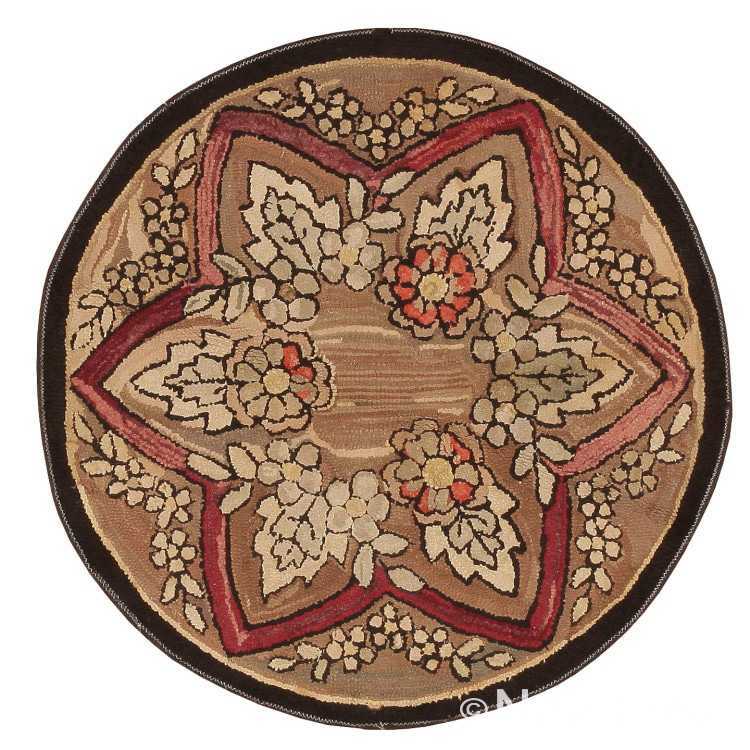 To add another dynamic layer to the pattern of the small round antique American Hooked rug, in select spots the smaller central leaves actually appear to overlap the red star pattern. This gives the Hooked rug a sense of story and makes it even more interesting to look at. It appears as if instead of being a two dimensional floral rug, there are layers that sit on top of one another. The colors of this round antique America Hooked rug are very earthy and full of warmth, giving it a very welcoming appearance that also showcases the artistry of the design. The colors are fitting for the natural and beautiful appearance of this unique round antique American Hooked rug. 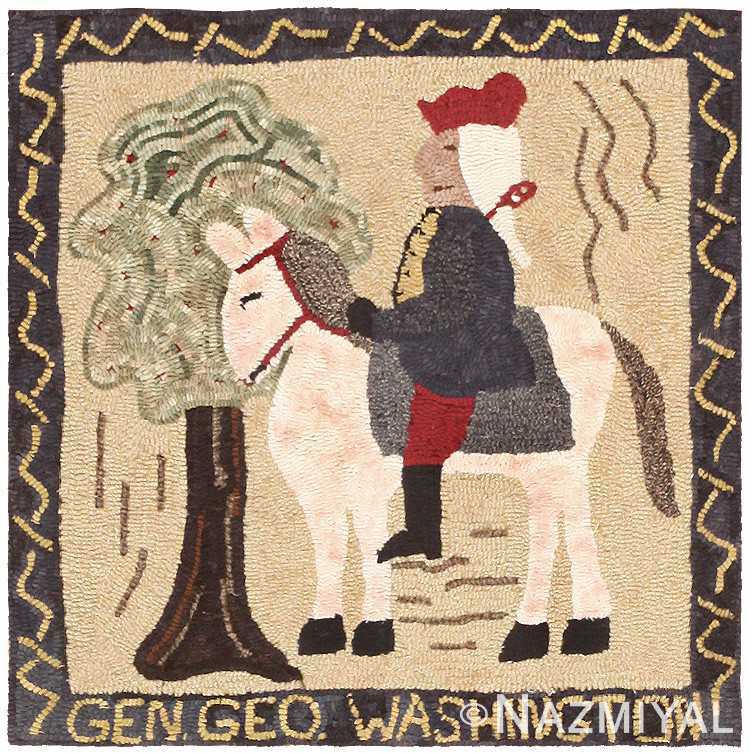 Full of history and whimsy, this vintage American hooked rug features a charming stylized portrait of General George Washington riding his iconic white horse. The drawing and coloration of this small size antique floral hooked American rug are entirely homespun Americana despite the influence of French Savonnerie design.